The announced Linde/PX merger terms provided by the companies today give a little bit of a boost to Linde relative to PX, which we expected, but at the same time create a company that at first look could provide meaningful upside. We believe that the companies are being conservative on the synergy side both in terms of amount and timing, although we think that our higher estimate of synergies may take more than 3 years. We believe that a $2bn target is more reasonable. 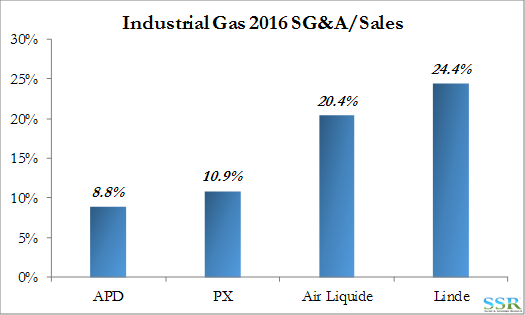 We also think there are some revenue boosters to consider as the combined entity should be the low-cost provider of industrial gas facilities globally and should win share of the overall industry growth at good margins – even if growth itself remains limited. With the level of synergies that we think are possible and a mid-peer EV/EBITDA multiple the stocks have as much as 25% upside from current levels. Faster revenue and EPS growth might warrant a higher multiple but we have been concerned for a while that the industry does not have the underlying growth to consume available cash flows in high value projects – see research – and that consequently the industry may re-rate negatively as underlying earnings growth slows. This is more likely to impact PX/LIN’s competitors, especially APD, rather than PX/LIN, but a sector re-rate could drag down multiples for all. Our assumption around synergies is in part a function of the very high SG&A costs at Linde today but also reflects our history with PX, watching the company steadily optimize every aspect of the business – as the merged entity begins to operate we expect earnings to see a constant cost based push even if the companies stop referring to the source as synergies. While divestments will likely be significant to get regulatory approval, we anticipate lots of interest and the possibility that the divestments are accretive – offsetting some of the lost synergy opportunities. Note: there remains an arb in the deal structure favoring LIN over PX today by around 6%. While we have been very positive on the proposed PX/LIN merger, we had been cautious about jumping in with both feet prior to the merger agreement because we felt that there was some upside to LIN, relative to PX and were concerned that it might pay out through a decline in PX, given our broader concerns about growth in the industry. Now that we have the agreement in principle and the relative upside in LIN is behind us we can look at the proposal holistically and we think that it has further upside, now played equally through either stock. The pro-forma value without synergies looks a little stretched, mostly on the gains that the stocks have seen since the terms were announced, but with suggested synergies the pro-forma looks interesting – Exhibit 2. The combined company is likely to blow through the synergy targets both in terms of amount and timing – our estimate is reflected in the stacked bar in Exhibit 2. Partly because of the higher synergies, the new entity should show earnings growth that outperforms its peers for several years to come. So, it should trade at least at the APD multiple – or the APD multiple will shrink to the new PX/LIN level – note that we believe APD to be expensive relative to its growth prospects. If we assume that a blend between the Air Liquide multiple and the APD multiple is a reasonable target – and we believe that synergies are light and represent only 50% of the real opportunity (see below) there is 25% upside in the stocks based on the close on Thursday. Without the boost to synergies the upside is 10-15% from current levels. 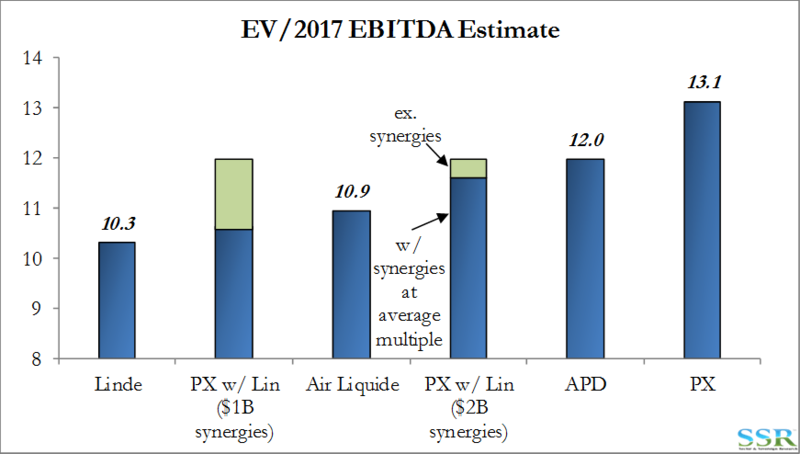 We do not think that PX and Linde are misleading us on synergy estimates, but we think they will find much more, possibly over a longer time frame, once they get into the weeds. 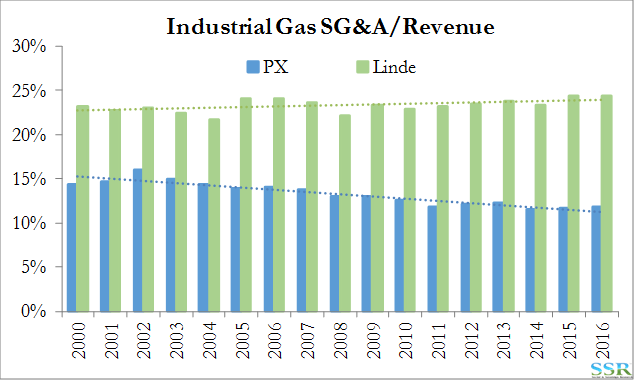 While the business mixes are different, the SG&A ratios by company suggest a lot of potential from moving Linde in the direction of PX – Exhibit 3. While PX is going to operate as a subsidiary of Linde, we expect many of the PX management and process styles to migrate to the whole company over time. APD is (as it should be) the winner in this chart as its lack of a major packaged gas business means lower overhead costs. Part of the difference between PX and Linde is mix, including the Linde Engineering business, but this only part of the difference. PX has a low cost – zero based budget – reputation and has used its lower cost base to deliver more profitable projects than its competitors for years. We expect a well-run PX/LIN to win more share of new business simply by its ability to deliver the same project/product at a lower cost. Another source of costs will come from logistics management, where PX again leads the field in terms of efficiency both in the merchant gas business and in packaged gases. We would not be surprised to see the overall synergy/cost gains to exceed $2bn within 4-5 years, almost twice what the companies are projecting. If the combined company can reduce the Linde SG&A number by one third – the gain that PX has made on its own since 2000 – this would save almost $1.4 billion. This ignores revenue synergies – a hard to define metric, but important nonetheless in this instance. Praxair has for years been the low-cost provider of small to medium sized air separation units, but Linde has been a relatively close second and has a strong position in the larger units and in HyCo. With Linde’s engineering skills we would expect the combined company to be the low cost provider for the majority of projects on offer in any year. This should lead to the company gaining share in new projects or forcing Air Liquide, Air Products and others to accept lower returns to bid business away. Best case is that PX/LIN outperforms on the top line and drives stronger EBITDA and earnings growth with better marginal returns. This would mean a high share of free cash flow being deployed in new capex, but at returns that boost the overall return on capital over time and drive stronger margins and EPS growth. The tradeoff would be lower share buyback, but investors preferred the faster growth, high return PX of the last decade to the slower growth, share-buyback PX of the last 7-8 years. Worst case PX/LIN outperforms deteriorating businesses at AL and APD, as they take business at lower margins and returns. PX/LIN would buyback more stock and have slower revenue growth but would likely significantly outperform its peers on returns and EPS growth.